I ate a lot of "stuff" when I was younger: Peanut butter stuff (kare-kare). Eggplant omelet stuff (tortang talong). That stuff with raisins (menudo). I don't know when or why I suddenly started asking the real names of the food I was eating. For a long time, I didn't even know certain dishes were actual Filipino foods, like tortang talong (which I still call eggplant omelet) or menudo. I just thought my mom made them up. This version certainly isn't a true Filipino menudo. For one thing, I didn't add raisins, and the raisins are what really make the dish -- I mean, that's how I identified the dish for years. But there were no raisins in my pantry, and being a Lazy Sunday, I certainly wasn't going out to the store for anything. Secondly, after doing a little blog research, I'm pretty sure a true menudo is made with pork. And liver. And garbanzo beans. But my mom doesn't use those ingredients. Occasionally she'll use pork, but it's always ground pork. I always remember eating menudo with ground beef. And that's all fine. I used to be weird about tweaking Filipino dishes, simply because I felt that they should always taste the way my parents make them. But that was before I started cooking them for myself. I certainly like to learn the original recipe first, but once I've got that down, there's no harm in playing around to create something all my own. So my version of menudo consisted of ground beef, onions, garlic, green pepper, potatoes, carrots and celery (not usually in the real stuff but added for color and crunch), soy sauce, stewed tomatoes (instead of the usual tomato paste), and no raisins. Served over rice. Of course it didn't taste like my mom's. I didn't make it very saucy either, which I later regretted. But it was still tasty and filling, and that's all that really matters in the end. have you ever had mexican menudo? it can be good or really really icky... mostly depends on how well the innards were cleaned. ryan - nah. i've had tripe before, and i'm not a huge fan. i'd try it, though, if someone else ordered it. I never knew there was a Filipino menudo, it's so different from the Mexican version my mother-in-law makes! And don't forget the french fry potato stuff, that's also a menudo. 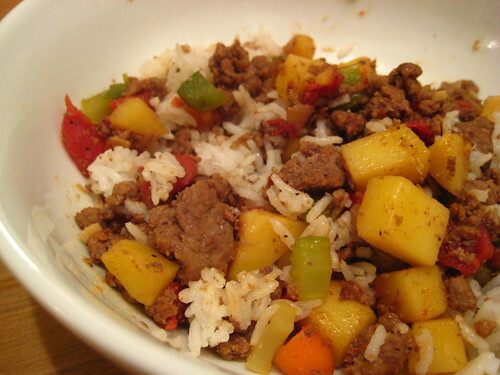 You know, when the potatoes are cut like french fries and there's beef and green/red peppers? j - are you sure? that always confused me. i thought the french fry potato stuff was caldereta. i guess i'll have to ask mom. True Menudo or not, it still looks good. Living in the Twin Cities area where there are no Filipino restaurants, I'd nearly forgotten the many different dishes that I grew up with - now it's mainly lumpia, pancit or adobo! Now, you've rekindled a memory of how much I used to love eating menudo! Menudo with ground meat and no raisins is plainly called "Giniling". Anon - The raisins really add something, but it's still good without! RG Gaviola - Oh, I didn't know that! It's so good and simple. Might have to make it again soon. :) Thanks for stopping by! This version is like "Giniling na Baka", another Filipino dish but you just added pork liver and celery.